AN ALIEN city costing £100 million is being built in the desert of the United Arab Emirates (UAE) that will be the ”most sophisticated building the world”, it has been revealed. The aim is to simulate conditions for human settlers on Mars as part of an enormous Scientific city project. 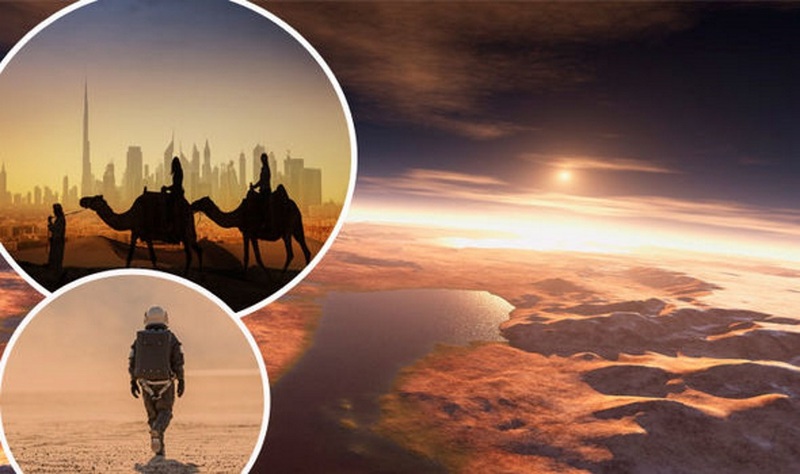 The UAE Mars Mission aims to make a human colony on the red planet by the year 2117. This comes after the UAE Space Agency unveiled plans to send a probe to orbit Mars by 2021. World-renowned architect Bjarke Ingels will design the city and it will consist of a series of futuristic domes. Mr Ingel’s martian city will feature laboratories for food, energy and water research and will be designed to withstand the red planet’s harsher climate and will have extensive radiation and heat shielding. The planet’s surface gravity is roughly 38 per cent of the surface gravity on Earth and its average temperatures are also much lower. The 1.9million square foot (176,5151 square meters) project was launched by the UAE earlier this week and will be the largest simulated off-world environment ever constructed. After it has been completed, a team of researchers will conduct a year-long experiment which will simulate colonist-living on Mars. Vice President and Prime Minister of UAE Sheikh Mohammaed said: ”The Mars 2117 Project is a long term project, where our first objective is to develop our educational system so our sons will be able to lead scientific research across the various sectors. “Human ambitions have no limits, and whoever looks into the scientific breakthroughs in the current century believes that human abilities can realise the most important human dream. More countries are developing space agencies than ever before which could lead to human life on Mars happen a lot sooner than we anticipated. The lessons learned from past exploration has allowed technology to improve. Recent developments have seen Ghanaian satellites launched, Japan planning missions to Mars’ moons, and China working on space rockets that are launched from planes. The city will also contain a museum dedicated to humanity’s greatest achievements in space exploration which it is hoped will inspire young people to pursue careers in science and mathematics. Have you ever listened to a superconducting magnet sing?